In his latest article "The Social Snobbery of Free Trade" Ian Fletcher goes on yet another of his trademark anti-trade, protectionist tirades, claiming now that free trade advocates are snobs who look down on protectionists as "dummies, losers, incompetents, hippies, rednecks, dinosaurs, closet socialists, or crypto-fascists." 1. The domestic producers are now better off because they are protected from more efficient foreign competition, and can charge higher prices and increase output. 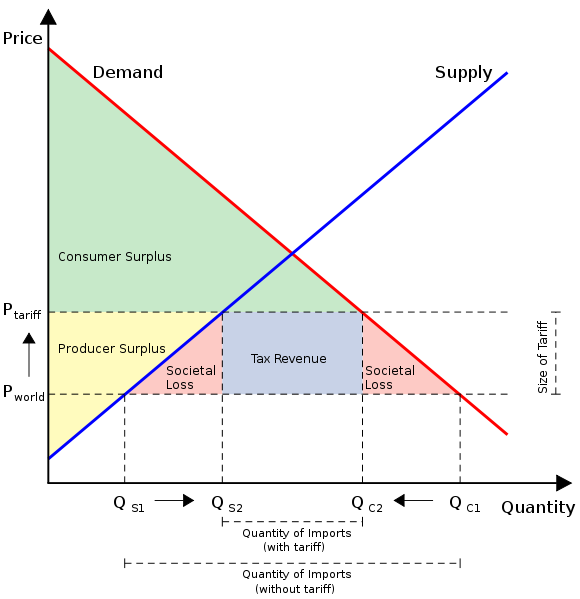 Economically, they have converted consumer surplus (gains) to producer surplus (gains) because of the tariff, and that transfer is represented by the yellow area labeled "Producer Surplus" above. Nothing lost there on net because of the tariff, although domestic producers have used the political process to gain at the direct expense of domestic consumers, who now pay higher prices and purchase fewer units. 2. With a tariff (tax) on imports, the government is now able to generate "Tax Revenue" in an amount represented by the blue rectangle above. This is also a transfer, this time from what used to be consumer surplus (gains from trade) to the federal government. Nothing necessarily lost here either on net, assuming that the government will transfer the tax revenue back to the consumers in the form of beneficial government spending (maybe) or lower taxes elsewhere (maybe). 3. However, the two pink triangles labeled "Societal Loss" are the amount of losses to the consumers and the economy (society) from the protectionist tariffs that are NOT offset by a gain to some other group: producers or government, and represent what economists call the "deadweight loss" or "deadweight cost" of protectionism. Bottom Line: The deadweight losses from protectionism mean that the economy is worse off on net, or that there has been a reduction in total economic welfare, the total number of jobs, wealth, prosperity, and/or national income. You could argue about the size of the deadweight loss triangles, but it would be really hard to argue that they don't exist. Protectionism has to make the country worse off, on net, and that proposition is supported by 200 years of economic theory and hundreds of empirical studies. Free trade advocates aren't snobs when they ask protectionists to engage in economic debate grounded on the underlying economic theory, where they can find out pretty easily that it is protectionism that is an "exceedingly dubious policy." Ah, an empirical analysis vs. Ian “the scarecrow” Fletcher and his army of straw men. Saw Ian at Trader Vick’s, his straw was perfect! A-WOOO, Ian the purveyor of economic fallacies! A-WOOO, Fletcher and his army of straw men! "dummies, losers, incompetents, hippies, rednecks, dinosaurs, closet socialists, or crypto-fascists." A definition of greed is taking $1 away in wages for a $1 increase in profit. Even worse than greed is taking away $2 from society to give $1 for politically favored groups, while destroying $1 in the process. thanks for finally posting this chart. it lays out very simply a concept that it is very difficult to get across to those with a mercantilist mindset. tariffs do not benefit the imposing economy. not ever. they are always and inevitably a source of dead-weight loss. they remain popular because the gains from them are highly concentrated and east to point to while the losses are dispersed and difficult to quantify, but, as this graph shows, they are always present and always exceed the benefits. Inquiry: The vertical axis (Price) has a segment that shows P world -> P tariff. Does this assume that the world has 0 tariff or is this the tariff level of the rest of the world? If the P world tariff is at 8%, then the U.S. could return to its founding level of tariff at 8%, and have a theoretical deadweight of zero. Article 1, section 8 of the U.S. Constitution's "general welfare clause" gives congress the the power to lay and collect duties. Alexander Hamilton pushed vigorously for duties, and James Madison reluctantly agreed to (lesser duties) what became the Tariff Act of 1789. George Washington signed the Act on July 4th and established a revenue stream on imports for the U.S. with a average of 8% on imports. Aside: an 8% tariff on sugar would probably be tremendously less costly to consumers then the non-tariff quota system now in place! PW is price before tariff is imposed. call it the world commodity price of oil for example. whatever else is built into that is irrelevant (though few countries tax exports). there is a world price and it is PW. the move from PW to PT is caused by the imposition of a tariff. think of PT = PW + T where T = tariff. thus, PT > PW in all cases in which a tariff is imposed. this analysis looks only at the marginal effects of tariff imposition. there is no such thing as "world tariff rate" that we can set ours equal to and not move price. there is the price before the tariff (however it is arrived at) and the price after. thus, any tariff will have these effects regardless of what the rest of the world does, meaning that even unilateral tariffs are net economic losers for the imposer and that an economy will always do better even under unilateral free trade that it will imposing "retaliatory" tariffs. there is no such thing as a tariff that is economically beneficial to an economy as a whole. Yes--but how is it China prospers mightily, following none of the precepts outlined here? Why does mercantilism work so well for them? morganovich, thanks, your explanation makes sense (duh on me). My inquiry did give me a chance to introduce the topic of non-tariff barriers. This is the weapon of mass construction or destruction for the world's mercantilists, at this time in history. How do you measure the lack of intellectual property enforcement on a chart? The deadweight zone is nebulous if goods (eg; copyrighted software) is stolen on a national level. it doesn't. mercantilism is hurting china. but it is not a one factor world. population demographics, the benefits of an industrial revolution, and a freeing up of capital (at least relative to before) are driving growth that swamps the drag created by tariffs just as you can keep your house warm even with the windows open if you crank the heat up enough. that does not mean that open windows in winter make houses warm. by your logic, you could point to a guy who smokes and runs marathons and say, "see, smoking doesn't hurt your lungs". It's easy to measure producer surplus-GDP-profits-wages, etc. However, it's difficult to measure consumer surplus. When a U.S. consumer can buy a $10 shirt from China that the consumer knows is worth $30, and is willing to pay up to $30, then how is the $20 in consumer surplus measured? When Americans consume up to $800 billion a year more than they produce, from international trade, then you know there's a huge amount of consumer surplus. Of course, in China, a consumer may not buy a shirt that's selling for $5 when it's worth $4. non tariff barriers are often even more destructive than tariffs, though i'm not sure how you fit intellectual property theft into that. that's not a trade barrier that is imposed, but rather a reason that people will seek not to trade. so yes, it may impede trade, but it does not do so to benefit local industry which does not have a competing product in many cases and worse, will have its IP stolen as well. a failure to protect IP is more than just a trade barrier, it's an economic barrier. perhaps the most effective long term NTB thicket around is japansese pharmaceuticals. japan keeps up a pretense that japanese physiology may be different from the rest of the world and demands that all products be tested in Japanese only trials before being allowed in. they are so draconian about this that pallets of tylenol send by relief agencies were left on the docks after the kobe earthquake. as a result, japan has some the highest drugs costs in the world and poor consumer choice. they would be better off even under high tariffs as at least them many drugs would be available at some (albeit high) price. Morganovich, elaborate a bit. I take your statement to mean that China would benefit MORE without mercantilism, that they are today with it. Would that the world was so simple, as you see it. There are huge institutional inperfections and impediments in the real world, that routinely flummox the application of clean theories to human endeavor. Man is not only a rational animal, but a social animal. There are issues of infant industries, and the costs of developing cadres of skilled and literate workers. Culture plays a huge role in economic development. China has developed rapidly, yet retained sovereignity, and kept foreign influences at bay. There is not a "bought off" ruling class in China serving foreign interests. While I prefer free trade and I am anti-militaristic, China's success shows there is more than one way to skin a cat, and that the interplay between culture, education, and industrial development is more complex than most bloggers can tolerate. That's why when I call for a one world solution--free trade, free immigration, free flows of capital and a world currency, there is such braying from people like you. You have an social/emotional attachment to the United States. You may even work for free, or even die on the battlefield, for that emotional attachment. Harnessed to an economic engine, such attachments can produce profits and industrial development--all outside the "rational man" theory of human behavior. Therefore, there may be reasons China is prospering that you do not undersstand. In fact, it is likely that most of what happens economically in the world is beyond your comprehension. that is correct. china's economy would have more wealth and more growth if they abandoned tariffs. as you can see in the graph in the article, all tariffs create a deadweight loss for economies. the purpose of a tariff is to raise prices. doing so creates a surplus for domestic producers and tax revenue for the government, but also imposes costs upon consumers and these costs always exceed the two previously mentioned benefits. the reason tariffs remain so popular is that the producer surplus is concentrated and easy to point to and the consumer surplus is dispersed and difficult to measure. thus, i at acme steel lobby for a tariff, knowing i will get significant profits from it. i claim it will "save jobs" and then i make political donations. the politicians love this because they can point to "jobs saved" and then collect tax revenue on top of it all while getting campaign donations. it is not difficult to see why politicians find this so alluring. meanwhile, the rest of you who do not work for acme steel are losing out. steel goes into products and you by them and pay more. this leaves you with less to spend on other things. this hurts every other company in the US and does so in a larger amount than i benefit over at acme and the government gains in taxes. china is just the latest government to reward favored industries and fill its own coffers at the expense of consumer welfare. i have no idea what that rambling response was intended to demonstrate. it has no bearing on china and tariffs. i will take your lack of substantive response to be a sign that you have no argument until such time as you actually have something relevant to contribute. you also clearly have not absorbed the concept of "optimal currency areas" despite having it explained to you over and over. a world currency would be disastrous and cause huge economic losses. the world is not an OCA even with free labor and capital mobility. the business cycles are insufficiently aligned. china and venezeula would not be well served by an identical interest rate. i find it odd that you can argue for the importance of local differences and then for a world currency which would come with a world interest rate which would fit few countries well. aren't you the big believer in monetary policy and stimulus to drive the business cycle? how do you reconcile that with a desire for a world currency. your views seem remarkably incohesive and incoherent. "You have an social/emotional attachment to the United States. " what an odd thing to say, especially as i have dual citizenship and have lived abroad in several countries. i have an attachment to many of the ideals and principals of the united states, but if you think i am willing to hitch my economic destiny to a nation state with monetary and fiscal policy this out of control, then you are gravely mistaken. you are either engaging in dirty rhetorical tricks (straw man argument) or you are so befuddled that you have been unable to grasp/recall anything i have ever said. so please, enlighten me: when have you ever seen me argue against freedom of trade, capital, or immigration? i defy you to find even one example. Too bad 90% of American voters and incumbents are protectionists. It has been and continues to be policy to artificially prop up the economy, housing market, consumer spending, etc.
" failure to protect IP is more than just a trade barrier, it's an economic barrier. It is not an economic barrier if IP is acquired without price. Almost all U.S. produced music, motion pictures and software in use in China has been illegally downloaded or copied phyically. Thus, the deadweight zone does not exist because of official malfeasance of not enforcing IP rights. Youare correct on one point: I was mistaken in rating high your loyalty to the United States. Your first loyalty is to money, obviously. Good luck with that. And bon voyage. "It is not an economic barrier if IP is acquired without price. Almost all U.S. produced music, motion pictures and software in use in China has been illegally downloaded or copied phyically." buddy, but this has a tremendous price. it is a massive economic barrier to anyone in that country who would go into those businesses. the result is that they cannot ever grow a software industry at all in much the same way that africa cannot grow a music industry or that countries that are big aid recipients never learn to fend for themselves because why would anyone start a farm when wheat comes for free in UN trucks? "Your first loyalty is to money, obviously." another ludicrous straw man with no logical basis whatsoever and another dodge to avoid admitting you were wrong about all your other claims as well. does this sort of repeated attempt at misdirection actually work for you? it and your strange, assumptive ad hominem just make you look incapable of coherent thought. there are many things i value far above money as you would also know if you had any sort of reading comprehension at all. i get into ethics arguments with folks like walt all the time. being interested in preserving and increasing your own wealth is hardly a bad or irrational thing. however, it does not mean that money is the primary driver in your life. are you now going to reverse yourself and claim that i ought to be subjugated to the desires of US politicians and that i ought to be patriotic and shovel tax dollars at them? it seems there is no end to your inconsistency and nonsensical tactical rhetoric. that may work on those (such as yourself) with a memory like an etch a sketch, but the wild variance and inconsistency of your positions is either the result of purely tactical argument or a failure to comprehend your subject matter. then, when cornered, you lob some ad hominem and non sequitor and run away only to appear on the next thread making the same arguments that have already been debunked as though none of the previous conversations had occurred. are you getting shock therapy or something? how is it you never seem to remember any of the previous conversations you have had? morganovich, I have an acquaitance, who is an African tribal chief, and he states categorically yes, food aid has destroyed farming in his homeland. I would also agree that freely distributed business software would be barrier to entry, but it sure lessens costs in every other industry that use it. "I would also agree that freely distributed business software would be barrier to entry, but it sure lessens costs in every other industry that use it." sure, theft always looks good on the margin. however, it also means that software will not be in your language, carry the features you want, or have any support or integration. it also tends to strand you on old versions as why would anyone ship new ones in to be stolen. then, ultimately, it backfires as it drives software or music producers to utilize draconian DRM software leaving you without new code or an industry to produce it. the costs of such DRM and enforcement get passed along to consumers and you are back to a big deadweight loss again. I would like to be a "shock jock," but I am probably put off by shock therapy--although I understand it is gaining respectability again, at lower voltages. Zap! I did no believe you have ever debunked any of my arguments. You sometimes argue as if economic theory was fact--but that does not "debunk" someone else's argument. At any rate, I am only observing that the real world of human endeavor does not neatly conform to anybody's pet theories, those that I subscribe to (such as Milton Friedman's) or those that I do not. The fact remains that China is prospering, has retained sovereignty, has outperformed many "free market" economies over the last 20 years. Japan has performed poorly the last 20 years. The answers may lie in culture and monetary policy, as much as manipulated trade. But keep your blinders on--it helps with self-confidence. Benjamin, sure, after what, hundreds of years of sub-par growth? China is the only continuous culture remaining after 2500+ years...They should own the freaking world...we should be speaking Chinese and using chop sticks. But their protectionist and isolationist views have kept it's growth and culture confined. They could be simply reverting to mean. Average incomes for citydwellers rose 11.5 percent in 2010 to 21,033 yuan (about $3,200). Rural per capita income surged nearly 15 percent, but at 5,919 yuan ($900) it lags far behind. Recent surges in costs for food and other basic necessities are hitting many families, especially those living on lower incomes. "My pension is just 1,700 yuan ($260) a month, and even if it has been raised a bit, it cannot catch up with rising prices," said Ji Minlin, a 62-year-old retired bicycle factory worker who said she and her friends were combing supermarket for bargains. "I do hope prices, especially food prices, won't rise anymore," she said. "Inflation in China has been on a tear lately, and Chinese consumers are feeling the pinch of rising food, energy and housing prices. Chinese food prices alone rose a staggering 10.3% (in January), up from a 9.6% pace in December... Housing prices rose by 6.8% during the month. "Lots of peasants' land has been confiscated to build apartment buildings and factories, and fewer people are planting food. All people can do now is just try to shrink their stomachs." Its (China) central bank has raised the level of reserves that banks are required to hold seven times in the last year, and raised interest rates three times in the last four months." My econ 101 is very old and I don't understand the graph. Would either of you be so kind as to either explain how the shaded areas represent the losses, surpluses and tax revenues shown? For instance, how does the yellow shaded area represent producer surplus? Thank you in advance for indulging me. Bob: Before the tariff was imposed, ALL of those labeled areas: (Producer Surplus + Societal Loss (2) + Tax Revenue) were Consumer Surplus. Now with the tariff, ALL of that previous Consumer Surplus is LOST to consumers. Some of that loss is gained by producers (yellow Producer Surplus) and some gained by government (blue Tax Revenue), but the deadweight loss is the Societal Loss, because it used to be Consumer Surplus, but is now completely LOST. One way to think about it: Producers have gained $1 or 1 job, but there has been a loss elsewhere of $2 or 2 jobs, so the country is worse off by $1 or 1 job. I did find this handy explanation of Producer Surplus. "I did no believe you have ever debunked any of my arguments." Well, there's one opinion, but you seem to be the only one holding it. "At any rate, I am only observing that the real world of human endeavor does not neatly conform to anybody's pet theories, those that I subscribe to (such as Milton Friedman's) or those that I do not." How can you say that? You support the notion of demand-pull inflation, which MF didn't believe exists. "Saw Ian at Trader Vick’s, his straw was perfect! A-WOOO, Ian the purveyor of economic fallacies! A-WOOO, Fletcher and his army of straw men!" Isn't that from Warren Zevon's famous song "Protectionists Of London"? I do get tired of saying "This is exactly true except when certain assumptions don't hold..."
Higher inflation could be mean reversion as well. China has had the worlds highest population for what, 2000 years? They were able to "feed" the masses by holding them in a constant state of starvation. So now you open up the market a bit, give people a bit more money...and surprise, they want to chow down. "At any rate, I am only observing that the real world of human endeavor does not neatly conform to anybody's pet theories, those that I subscribe to (such as Milton Friedman's) or those that I do not. another meaningless babble of incoherent ideas that add nothing to the discussion. you are the one that asked the ludicrously oversimplified question "Yes--but how is it China prospers mightily, following none of the precepts outlined here? Why does mercantilism work so well for them?" implying a one factor world. now you change your tune and argue for complexity? you either have the memory of an etch a sketch or truly have no ability to comprehend these topics at all. you seem to have no core understanding or position all all, just a mishmash of random, internally contradictory nonsense and misunderstood doctrine that you attempt to back up with ad hominem, appeals to authority, and straw man arguments. your whole position is based upon assumptive logical fallacy. china is successful and performing well. china has mercantilist trade barriers. therefore, mercantilism makes china more successful. can you not see the egregious logical flaw in that reasoning? lance armstrong won more tour de france titles than any cyclist in history. lance armstrong had testicular cancer. therefore, testicular cancer makes you ride faster. in both cases, an impediment to performance is being claimed as an enhancer of it because you mistake coincidence with causality. The pink area is a loss to whom? "If we purchase a ton of steel rails from England for twenty dollars, then we have the rails and England the money. But if we buy a ton of steel rails from America for twenty-five dollars, then America has the rails and the money both." The real deficiency of this analysis is that it is the ivory tower view of free trade which does not include outsourcing. Pieces of paper for steel? What's wrong with that? It's easy to understand why Fletcher resents being called a dummy, it's because he is a dimwit. He has the leftie debating style down though: make a bunch of vague accusations that the other side is making up stuff and that generally accepted opinion of the "experts" is on your side, without ever making any specific claims to back that up, then sputter on with arrogant and idiotic indignation. If one actually scrounges around for what his arguments are, they're a grab bag of marginal arguments that are only available in a link at the bottom of the linked post. All the familiar protectionist canards are listed, including some obvious points like pollution being outsourced. Clearly he is either ignorant of how those are far outweighed by the benefits or he chooses to ignore it so he can rail against free traders regardless. Frankly, if your opposition is this dumb, I don't see the point in even addressing Fletcher's quackery.